It is still snowing. (Or at least it was.) After almost a whole week, the snow kept falling. And while readers in colder climes like North Dakota or Montana or even Eastern Washington would shrug it all off and wonder what all the fuss is about, the fluffy white stuff has disrupted the normal flow of life here in Western Washington. For the kids and me, that means no school. Which means shoveling snow, sculpting snow, and making a structure of snow. I am compelled to shovel any amount of snow that falls on the driveway and sidewalk. 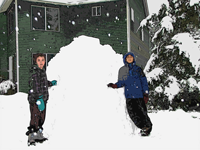 When we were kids, my brother and I would go out to shovel whenever it snowed. Our dad did not like to have the tire tracks iced onto the driveway so there were times when we had to chip away at the ice until we got to the concrete. When we were young, dad helped, but as we got older, we had to do it by ourselves. I hated to chip, chip, chip away at the ice so I decided I would do the best I could to keep the snow off the driveway and avoid forming icy tire tracks. Even if that meant I had to shovel snow before and after supper. Living in Spokane, Washington, I remember shoveling snow in the dark quite a bit. Now, living in Western Washington, I know that I could let the coming rain (it is always coming soon) melt the snow away, but I cannot do it. I must go out and shovel as soon as the flakes hit the ground. When the snow is as packable as it was this past week, I have a secondary reason for shoveling – gathering snow for sculpting. I do not fancy myself an artist, but I do like to try my hand at sculpting snow. I have made snowmen and snow cars and even a few snow animals. This week, I probably wasted the good snow, but there was so much, all I could think to make was a castle tower and wall. The tower started out as the pile of shoveled snow from the driveway and sidewalk. I packed it and piled it and then started to form it. I made the battlements on top and then cut away the pile until it resembled a castle tower. Since it kept snowing, I had lots of snow for sculpting and used some old recycle bins for brick molds and made a short wall to go with the tower. I made it doubly thick so it would not fall on anybody. Both the tower and wall were stoutly constructed. I know because I saw the neighbor boys sitting and climbing on them that evening. I thought about it later and decided that if all the adults in the cul-de-sac had been outside playing in the snow, we could have made several walls and towers and maybe some cannons. Then, we could have had a massive reenactment of some medieval battle. Or just had a simple snowball fight from behind sculpted castle walls. The snow was not only perfect for snow sculpting, there was enough of it to make an igloo. So we did. Thing 2 and Thing 3 helped me construct a large igloo. We packed snow into the same recycling bins to make large bricks. Then we stacked the bricks up to form the walls. Each course of bricks was slanted more inward so as to make the dome shape. It was great fun and hard work. 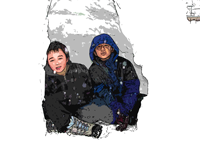 But when we were done, both boys could easily stand in the igloo. If we really needed to, we could even have used it to weather the storm. At least until it got too warm and started melting. We got an inkling of what the warmer weather would be like the day after we built it. It warmed up to about 33 degrees and it looked like one of the walls would buckle before the day ended, but in the end, it just shrank a little. Even though we seem like snow wimps here in Western Washington, I am thankful that I got some time off to shovel snow, sculpt with snow, and make structures out of snow. It always makes my day when I can do those activities. So even if I complain a bit in June when we make up the days. And even if it means going to school until July. And even if I need to keep shoveling snow, I will not really complain too much that it is still snowing.